Dark impressions chased us out of Salinas early in the morning. By this time our excitement about things to come here in the Dominican Republic was waning and doubts were taking their place. We'd had such a beautiful image in our minds about how it would be and the reality was not living up to those standards. But as usual, our time out in the open water melted away some of the negativity hanging around us as we set our minds to reacting to the more immediate events. Planning our tacks in an effort to make the best time we could took all of our mental energy. Getting the boat around these points of land with opposing wind can be a challenge but with all day to get where we're going, we enjoyed the game. We were headed for Boca Chica and the Marina Zar Par. We decided not to let the unfortunate words of other cruisers back in Baharona color our experience. We've enjoyed far too many places that have been badly reviewed in the past to let this get us down. Once we got around Punta Palenque we were home free! As what must surely be the Capital City of the Dominican Republic, Santo Domingo loomed on the horizon, we began to notice increasing amounts of trash floating in the water. Thus far we've really been amazed at how little trash we've seen... but here, signs of the huge population in and around the city became evident. As we continued on along the coastline we realized that the floating styrofoam must be coming from Rio Haina which is just west of the Capital. Once the buildings ashore began to thin, so did the trash! The only thing we found floating in the water once we had past the city were these floats with flags attached. They had some sort of floating box and either a net or a balloon drifting beneath the water's surface. We saw at least six of these thing and we wondered what they could possibly be. Were they weather balloons? Or were they drug drops awaiting some high speed boat to come out here and scoop them up. We studiously avoided them just in case and hastened on our way. Instructions for getting into the harbor area at Boca Chica were vague. Looking at it on the chart, it seemed that you could just head right for it. But when I checked it out on Google I saw that we had to enter from the west and move along close to shore to get inside the protective reef that makes Marina Zar Par so desirable. Once we got closer to the small island we could see the very clearly marked channel leading us into calm water. It was strange motoring into what looked to be an industrial boatyard but once we passed the huge container ships and other ocean-going vessels, things began to look a little more like our kind of place. I had hailed the marina on the radio but got no answer until we were well into the channel between the small island and the mainland. We had already decided that we would just find a place to anchor and check in the next morning... when we heard the marina telling us to stay close to the ships for deeper water. We had to pass right in front of their bows but depths were ample and we could see the marina staff ready to tie us up alongside an easy-to-manage T dock right in front. After a long day on the water, we were tired and apprehensive about the check-in process so the extra hands getting us docked was a welcome sight. As soon as we got the boat secured, I left Bruce to finish up and took our Despacho to see the Agent. There were some tense moments when I learned that the prices advertised on the website were not entirely accurate. I thought we had a deal to stay in a slip for a month... when suddenly the price was higher than I thought. You only get the lower monthly rate if you agree to pay for two months in advance. I had a visit with Victor who is an Agent in the capacity of greasing the wheels of Officialdom to facilitate ease in obtaining the needed Despacho... This means - a middleman who will make the process of dealing with Officials who want to squeeze money out of Cruisers a little less unpleasant... for a fee. At this point we are undecided about where we will go next, so it was nice to talk to Victor and learn what our options were. And he spoke English... a HUGE plus! We stayed the night on the dock and then took advantage of not having to use the dinghy to get to and from the shore, we did our laundry and made a grocery run. The laundry machines took three tokens per load and the dryer was large enough to do two loads for four dollars. Each token was $1. It had been a long time since we had had the opportunity to wash clothes so we had a lot! One of the perks this marina offers is a free ride to the Olé Supermarket in nearby La Caleta. We were horrified at the traffic between the marina and the store and were glad for the driver to deal with it instead of having to make our way to the store on our own. No idea what they do with all this dried fish! The grocery store was an event in itself as we navigated the aisles of this huge store (think Super Walmart) where there were clothes, electronics, furniture and groceries... all at really great prices. Finally we had arrived at a place that shopping was a pleasure! Once we were done with our purchases, we had to try to communicate our need to be taken back to the marina to the customer service staff. That was not much fun as they looked at us like we were aliens... But eventually they took us back. It's a nice arrangement that the marina has set up for us. Later that evening we moved the boat out to our mooring ball. 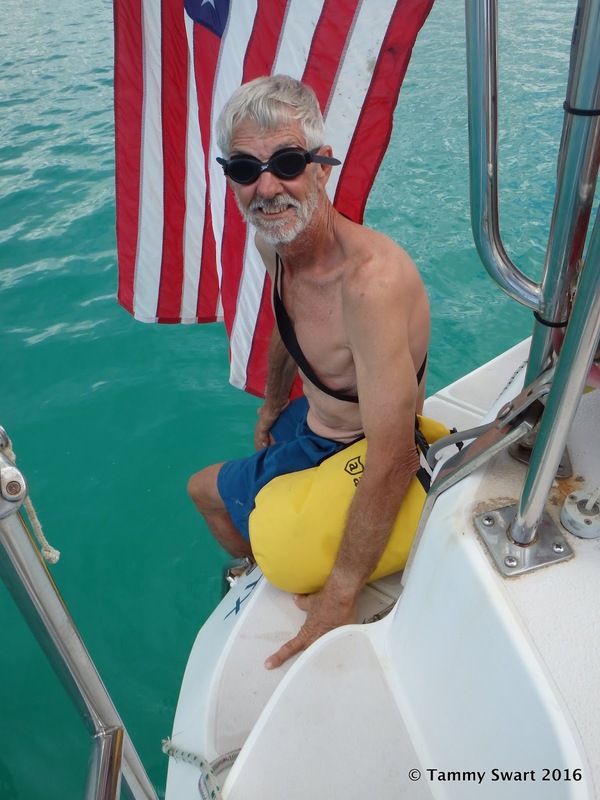 Bruce had to go out there with the Harbormaster (Rigo, who turned into a friend) and put a float on the pennant so that we could catch it with the boathook... ??? We had a front row seat to all the traffic and excitement going on in the harbor for those days... never a dull moment. More trips to the supermarket. Nice dinghy dock! Marine store about a block away. Nice folks! Little Colmados everywhere. They all sell liquor! We enjoyed talks with Rigo and I picked his brain about all-things-Dominican. We enjoyed our leisure and the nightly cocktails and sundowns. Active Captain is full of complaints about the loud music here. Mostly we enjoyed the free entertainment, although sometimes it was not to our taste. This large protected basin is very popular with the Locals and they come out all during the week, especially the evenings. The wind was blowing like crazy most of the time but mornings were calm from the effects of the island on the tradewinds. We fell into a comfortable rhythm in our temporary home while we got the boat ready to receive our guests. We had some frantic times... our dinghy needed to be patched. When we started working on it we realized that our poor old dinghy may be on it's way to the junk heap. We spent a couple of days exploring the possibility of obtaining a new one. Not really possible. So we patched it as best we could and it will work for a while longer. He's gonna swim for it! But while the patches were drying, we couldn't use the dinghy and therefore we couldn't go ashore. Also during this time... we noticed that our freezer had QUIT WORKING!!! Yes. Just days before we were to receive guests and with a full box of rapidly thawing meat... the freezer quit. And in sympathy, the refrigerator also stopped performing. I guess the freezer had been carrying the weight for the fridge. Yes! Score one for the Old Guy!!! My Hero!!! Bruce found Rigo, who arranged for us to come back to the dock and found a refrigeration repairman who appeared within minutes! He quickly diagnosed the problem and came back later that afternoon with the parts. We were happily cooling down again before happy hour! And the price was a LOT less than we would have paid in the States. Finally the day arrived for Robert and Kathy to come. The waiting was OVER! They'll be here tomorrow!!! !